Durable. Reliable. Amazing Longevity.. 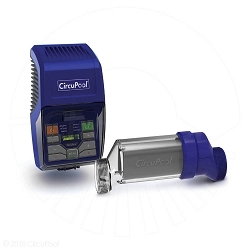 Choose the CircuPool RJ-PLUS Series for a long-lifespan salt system that gives you the most control and features titanium cells powerful enough to handle even the largest backyard pools. For over a decade, RJ-PLUS Series salt systems have been a customer favorite. With unparalleled longevity and reliability, RJ-PLUS Series salt systems are the smart choice to keep your swimming pool clean and clear without the use of harsh chemicals- plus 50% savings or more over conventional chlorine. The CircuPool RJ-PLUS Series is the salt chlorinator that pool owners have come to love and trust! The CircuPool RJ-PLUS Series salt chlorinator systems are a great choice! Looking for all your options? The savings add up quick - a salt system can provide many hundreds of pounds of free chlorine over its lifespan. Ensure a consistently blue pool without the hassle - you get predictable, automatic pool sanitation every day. Provide your family and friends with a luxurious, natrual swimming experience - no harsh chemicals. Choose a salt system with a max capacity of 1.5x to 2x the pool’s actual number of gallons. Choose a salt system backed by the industry's best warranties and award-winning support that makes it easy for pool owners. It’s the preferred choice. With over 30 years of history, salt systems are safe for virtually all pool surfaces and pool-grade materials. As of 2016, over 70% of new pools in the US were saltwater.